It’s often difficult to find quality ways to spend time together as a family. If you’re searching for an ongoing activity to keep your family engaged and entertained, a garden is a perfect choice. A family garden will help get your kids outside enjoying nature while also learning about plants and food. 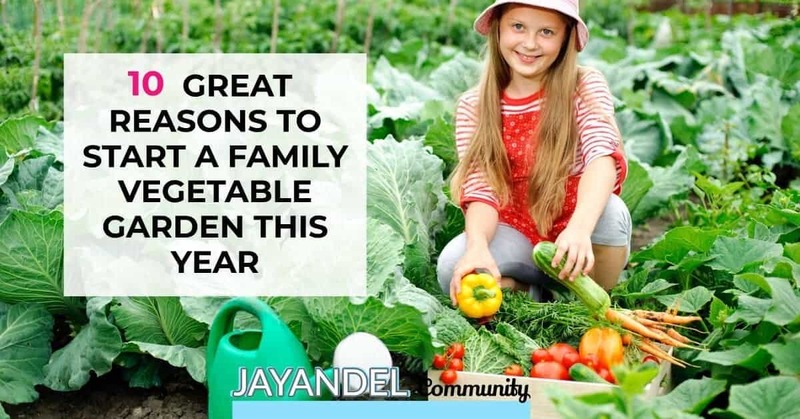 If you’re still not sold on why a garden is a good idea for your family, keep reading for 10 great reasons to start a family garden this year. Your kids learn the concepts of science in school each year and putting those concepts into action is a great way to reinforce those school lessons. Gardening teaches your kids about the life cycle of plants, as well as the vast ecosystem of insects and animals that will likely interact with your garden every day. A garden must be tended and cared for on a daily basis, which teaches your kids how to be responsible. Kids of any age can take part in most of the gardening activities that are needed to be taken care of each day, including weeding, watering plants, and harvesting vegetables when they’re ready. And if your kids slack off on their daily garden chores, they’ll quickly see the consequences. A garden full of weeds or a withering crop will quickly show them the importance of being a responsible gardener. Working in a garden burns tons of calories. So if you’re searching for a way to get your kids off the couch and away from their screens, a garden is a great option. From tilling the soil for planting seeds to crawling through the garden rows to pull weeds, your kids will get some much-needed exercise each time they get in the garden. If your child is a part of a vegetable’s life cycle from planting the seed in the ground to plucking the vegetable off the plant, it’s more likely that your kid will eat that vegetable when it’s cooked. They’ll love the adventure that comes with picking their food for dinner and helping you cook each vegetable in different ways at dinner time. Buying fresh fruit and vegetables for your family can quickly add up. But if you grow those same fruits and vegetables in your backyard, you’ll be saving yourself a lot of money. Think about this – a package of seeds costs less than a dollar and you’ll likely get a month’s worth of vegetables from one seed packet. How much would it cost to buy a month’s worth of tomatoes at the supermarket? Definitely quite a bit more than one dollar! A bounty of organic fruits and vegetables, combined with the additional workout you get each time you work in the garden, equals a healthier family throughout the gardening season. And on top of that, your family will spend more time outdoors in the fresh air soaking in all that vitamin D from the sun each day. There are numerous ways in which a garden can bring your family together. Planning your garden will give your family a chance to pick which plants will go in your garden while also giving your kids a chance to voice their opinion on the family activity. Then, your family can come together to till the garden and plant all the seeds. Next, your family will work together to maintain the garden as it grows, including finding ways to get rid of pests and experimenting with ways to help your plants thrive. Finally, your family will enjoy time together eating the bounty your garden provides. This reason may be more appealing to your kids, but their opinion counts too! Your kids will love the opportunity to get dirty with your blessing. Whether they’re digging in the dirt to plant the seeds at the beginning of your garden adventure or digging up weeds as your garden grows, the chance to get dirty will always be appealing to your kids. A garden doesn’t have to be huge to be beneficial. If you don’t have a large yard or want to start small, a container garden is a great way to reap the benefits of a garden without as much work. You can even consider a vertical garden space if your yard isn’t big enough for a full-blown family garden. A family garden doesn’t have to be limited to your family. In fact, it’s likely that you’ll have more fruits and vegetables than your family can handle at some point throughout the gardening season. This abundance will give your family a chance to give back by donating some of your fresh produce to those in need. Whether you pass along your extra veggies to friends and family members or donate some of your extras to the local food pantry, your family will enjoy the chance to give back after all their hard work on the family garden. An aspiring writer from Birmingham, UK who writes about a bit of everything. I love working out, taking care of myself, nature, wildlife and am a little bit of an oddball.